These two lots (later divided into four) were owned from March to December 1859 by Nicholas and Virginia Earp on Block 15 (the east half of the block facing 5th Street, with Broadway to the south and Archer to the north). Nicholas Earp bought the property for $800, sold it for $800; it was then sold in 1862 by Montgomery to Harding for $800. 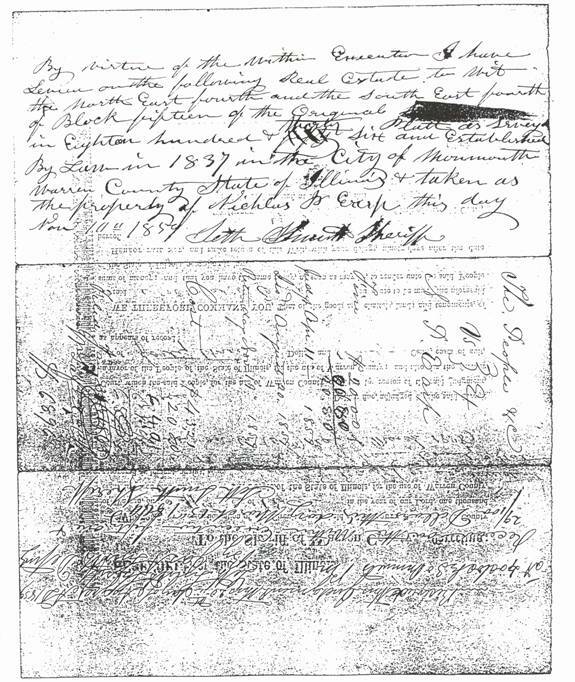 Note that Earp's sale of the land was registered before he registered its purchase; this was his common practice, and in this case was probably connected with the sheriff selling the land at public auction. Nicholas Earp's sale of the land was complicated by the sheriff seizing it for failure to pay the fines that followed his convictions for selling liquor illegally. See The People Versus Nicholas Earp. William Cannon acquired the property in 1862 and in 1864 borrowed money to build a house that he sold in 1866 for $3000 (almost illegible in the microfiche copy, could be $5000); two years later it sold for $5000. This is roughly the same pattern noted for 403 South Third, when the property value jumped dramatically. assessed in 1864 and 1866 at $200. * Empty lots were usually assessed at $30-40 in the 1840s, $75-100 in the 1860s; lots with houses tended to be estimated at less than actual sale prices; in the case of Block 15, the value of the empty lot or lots in the slough would be significantly less. Most of this slough was later filled in, so that today one cannot even see where it was. The Ruger map of 1869 shows the Earp property two blocks to the right of Monmouth College's Old Main. The horse and wagon are at what is today Sixth Street; Fifth Street is the next to the right. The Ruger map is drawn from the north, which shows that in 1869 there was a substantial building on the SE corner; much of the rest of that property (east half of block 15) was a slough (a gully) that was of little value�although later the two lots on North 5th Street were made into four and three additional small houses were laid out there; two of those houses still stand. In this second detail map, one can see the slough well. The wagon and horse are on Broadway, going east. One would imagine that $800 represents the value of a small house (and the rest of the property being of low value)--maybe the small structure in the middle of the property? Or a small house that was incorporated into the L-shaped structure built in 1864--a very busy year for construction in Monmouth, since everyone was flush with the money that the Lincoln administration was paying for corn. This was a very common practice at that time. The present structure at Broadway and Fifth clearly dates from a later time. The Wyatt Earp birthplace museum association disagrees.